Warning: Major Doki Doki Literature Club spoilers feature below. Last year, Team Salvato's Doki Doki Literature Club took the gaming world by storm by blending a dating sim with psychological horror elements. 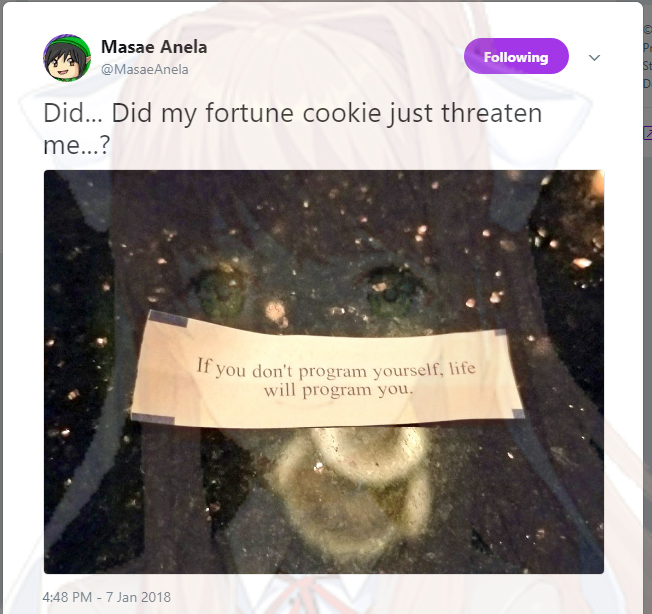 The game has since built up a niche following, with fans creating plenty of memes around the titular literature club's president, Monika. 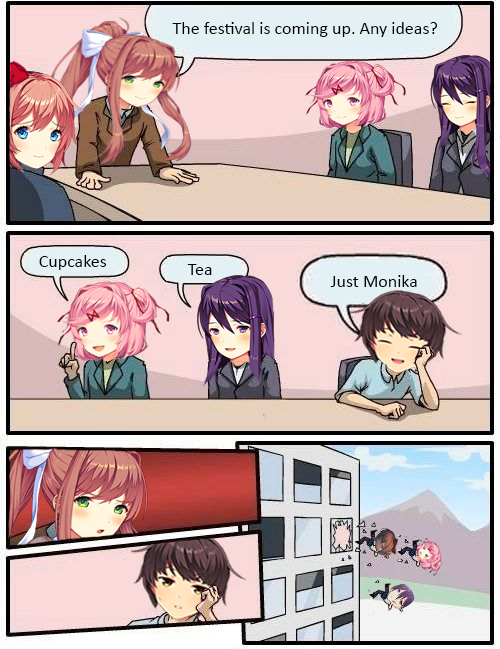 Hence the phrase "Just Monika." 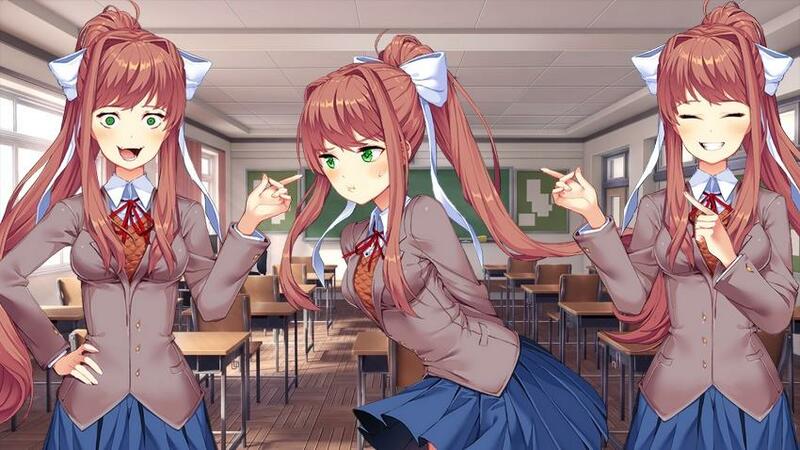 For those unaware, "Just Monika" references a scene during the game's second half. After one of the four main characters, Sayori, commits suicide halfway through the game, it's revealed that Monika purposefully sought out ways to drive the game's three main love interests away from the player in an attempt to date whoever is playing the game. 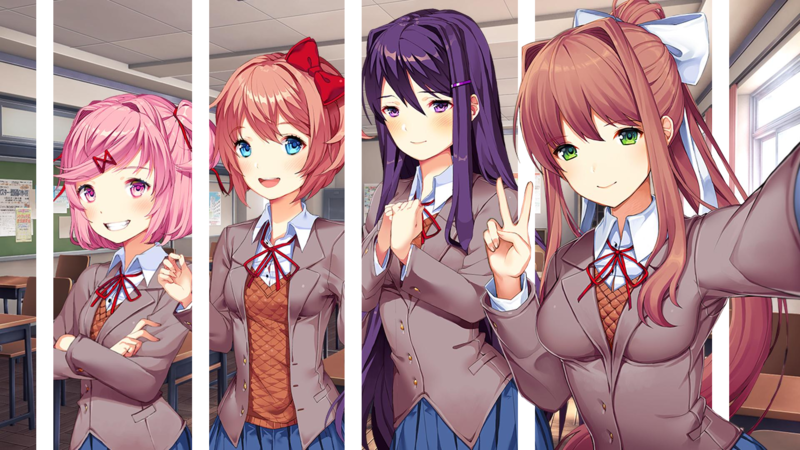 Eventually, this culminates in Monika spamming the phrase "Just Monika" over and over again, deleting the remaining girls, and lovingly staring at the player as the literature club classroom floats in an empty space vortex. For some, the game's twist reveal is pretty disturbing. But others find Monika charming, comparing her personality to the "yandere" anime character trope, in which outwardly warm characters gradually show signs of sociopathic and manipulative behavior. 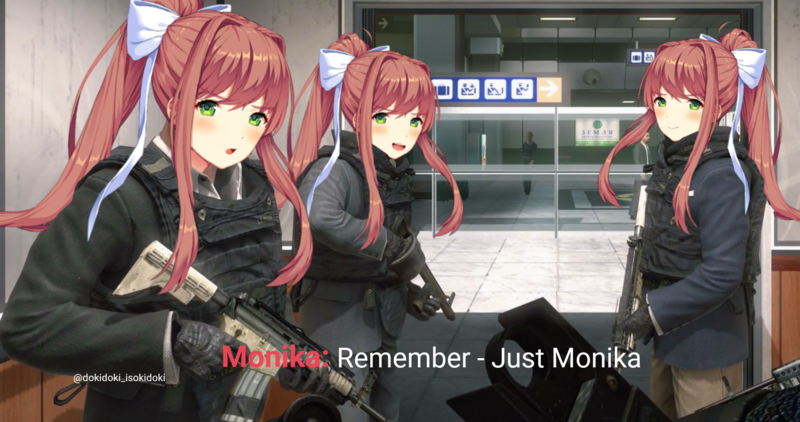 As a result, "Just Monika" has turned into a meme, with fans using the phrase both in reference to the reveal and to express appreciation for the game's antagonist. 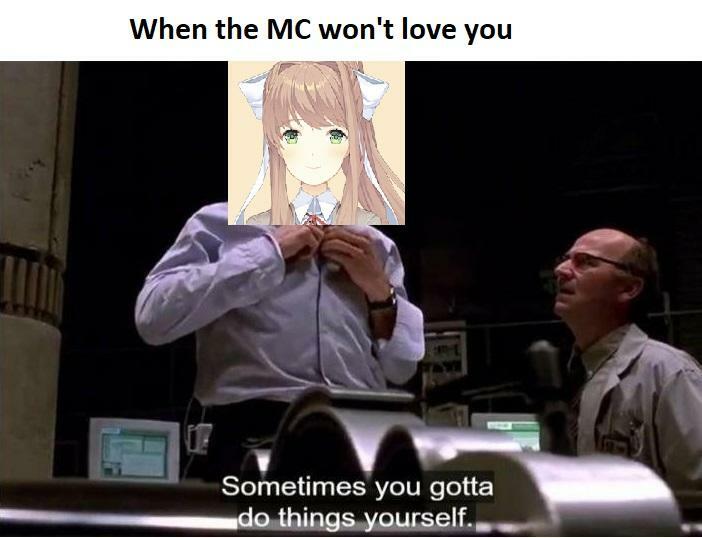 With all that said, here's some of the best "Just Monika" memes corrupting the internet. Why date 3D girls when you can date the best 2D girl? Monika is clearly our Valentine. 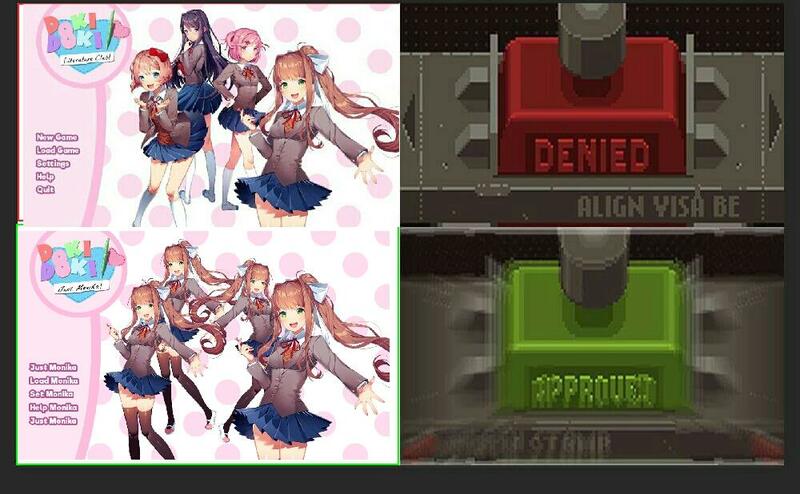 Don't expect to enter Arstotzka unless you're coming for Just Monika. 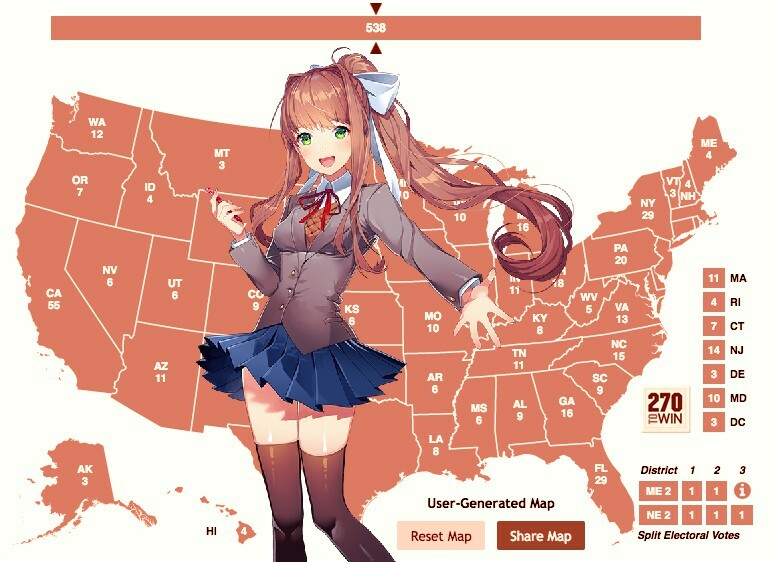 Russian interference in the U.S. election means from now on, Americans should just think of Monika for president. She'd probably stand up for net neutrality, anyway. Now this feels like a badly needed improvement to Doki Doki. Hint: Check out each Monika's eyes. Even the colors have been changed on her irides. Dan Salvato put together an official Twitter account for Monika, where she tweets from at @lilmonix3. One tweet features Monika offering to send a virtual hug and "fixing" the loading bar when it jams. The gif, which was created by student animator Gespenst, quickly went viral among Doki Doki fans after Monika tweeted it out. After all, who doesn't want a hug? Remember Shia LaBeouf's incredibly intense motivational speech, "Just Do It," from back in 2015? Well, you don't have to let your dreams be dreams when it comes to Monika. LaBeouf would be proud. If you grew up in the 1990s, you probably remember Lou Bega's hit 1999 single "Mambo No. 5." Well, Doki Doki fans quickly picked up on the opportunity to parody the song with references to "Just Monika." In one YouTuber's case, this turned into a song edit showing Monika messing with the other Doki Doki girls while changing the lyrics. Check out the full version above. 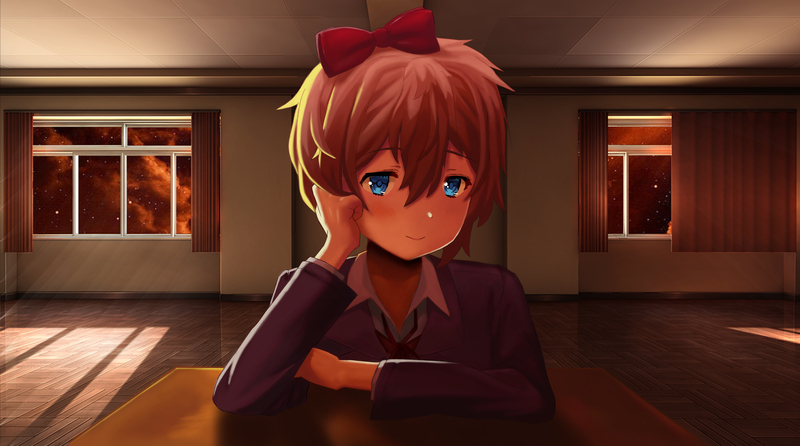 In Doki Doki Literature Club's normal ending, the game concludes with Sayori becoming conscious of her role in the game and subsequently falling in love with the player, leading Monika to delete the entire game. But what if Sayori wasn't deleted and she ended up taking Monika's place? Yuri inevitably takes her life at the end of Act 2, and unfortunately, the player cannot do anything to stop her. 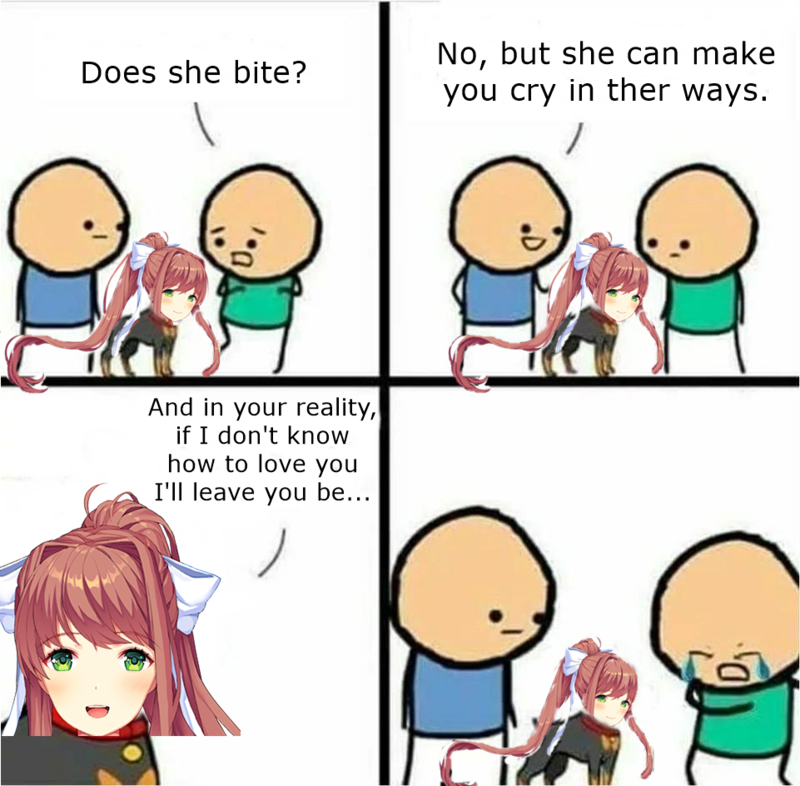 But deep down, some fans wish that they could spend the rest of eternity with her, not Monika. For all the Yuri fans out there, this meme is for you. Hey, it's the whole crew unharmed in a meme for once! Except somehow Monika broke out of her frame. Honestly at this point that's to be expected. Oh hey, here's a great round of bingo. Surely, Monika would approve, no? 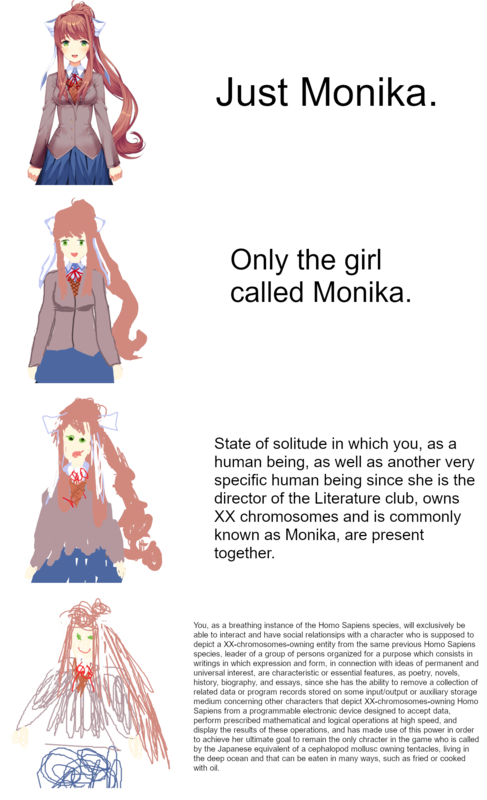 For those who wish to partake in isolated interactions with the humanoid visual novel character known as Monika, the president of the club dedicated to literary pursuits, this one is for you. Now this is a pretty accurate portrayal of playing through Doki Doki Literature Club. For those who don't know, this meme references "No Russian," the first mission in Call of Duty: Modern Warfare 2. Notoriously controversial at the time, the level focuses on Joseph Allen, an undercover CIA operative who works with Russian terrorists during a mass shooting in a Moscow airport. Although players do not have to kill any civilians to finish the level, the mission was incredibly controversial at release due to its graphic nature and depiction of terrorism. Oh hey, the festival is coming up, and it looks like the protagonist just had a great idea. Sorry Sayori, Yuri, and Natsuki. Hm, looks like Monika took this viral Twitter post to heart. Maybe a little too much, even. Whoops. Now this is the Doki Doki Literature Club experience I crave. Make it a reality, Dan Salvato. 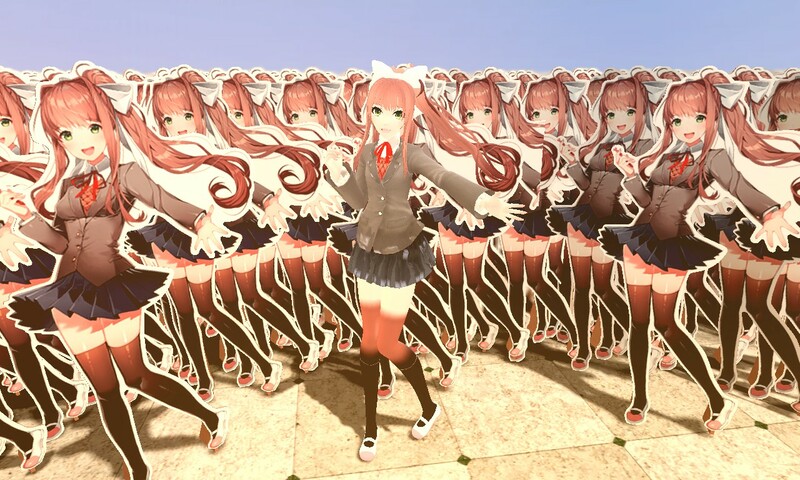 Now that's a lot of Monikas. Judging by how many individual cow licks can be seen in the photo alone, it looks like there's at least a couple dozen Monikas. Wow. This Cynadide & Happiness edit pretty much sums up what it's like to finish Doki Doki. Ouch. Monika isn't a coward, that's for sure. 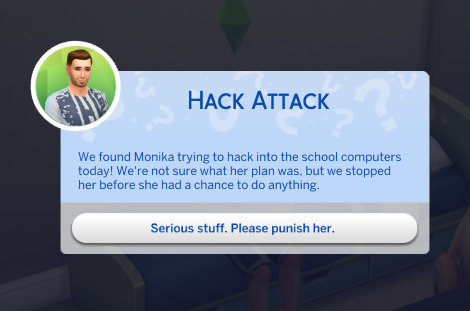 Looks like Monika ended up breaking into the world of The Sims 4 somehow. But don't worry, it looks like the school caught her. Hopefully they'll punish her. Spend some wholesome time with Monika.